Natural deodorants have come a long way since they hit the market years ago. I recall being sent one of the very first ones on the market by a PR company and thinking it was awful. It didn't smell good, it felt grainy when it was applied, and it was barely effective. But over the years, they've improved dramatically, and the selection has grown considerably. 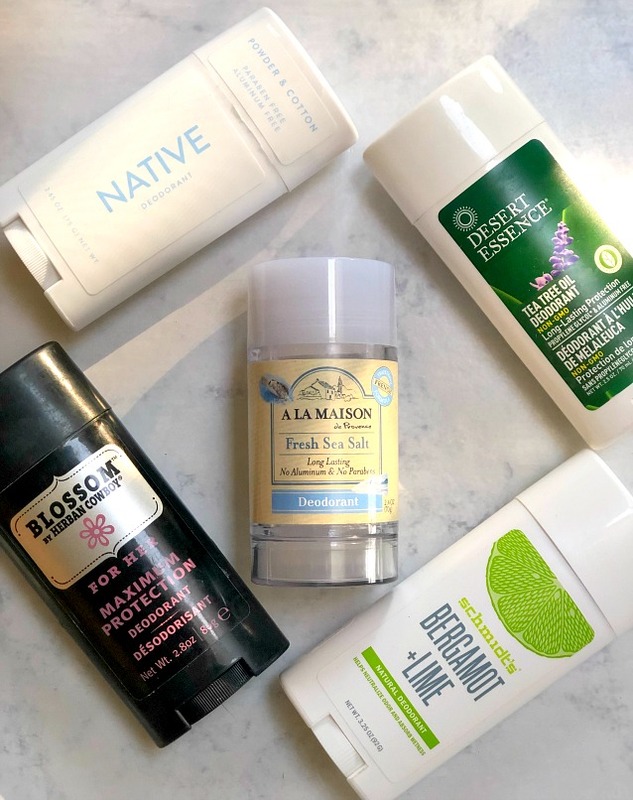 While I haven't tried every single natural deodorant available, I have tried my fair share of them. First off, let's chat about what natural deodorants are and aren't. One of my most questionable ingredients in conventional antiperspirants is aluminum. Aluminum salts are used to clog the pores of your underarms to prevent you from sweating. Deodorants do not contain aluminum - only antiperspirants do. In many studies, aluminum has been linked to Alzheimer's Disease and there has been concern with its link to breast cancer. This article from Well+Good is a good resource and worth checking out if you have concerns or are thinking of making the switch. Also, many natural deodorants contain baking soda, which for many people can be irritating. If you try a natural deodorant and find that you are breaking out in a rash, switch to a sensitive-skin formula. Native ranks at the very top of my list. It's both free of aluminum and parabens. It glides on smoothly and has lasting power. A few swipes in the morning is all it takes for the entire day. It also smells really good. The scent is delicate and fresh. If you are a fan of Secret's powder fresh scent, this deodorant is for you. Native is more widely available now than it used to be. You can find it at Walmart, Target, as well as Whole Foods. Before I tried Native, Schmidt's was my go-to natural deodorant. I love this scent, and Schmidt's offers a wide variety of scents (as well as other natural self-care products). Schmidt's offers trial sizes, so you can try scents before you buy a full-size product. You can often find Schmidt's at Marshall's and TJMaxx as well. I was first introduced to this French brand when a friend gifted me a basket of A La Maison products as a hostess gift. The basket didn't contain deodorant, but it did contain bar soap, liquid hand soap, body wash, and hand cream in the sea salt scent. I was hooked. When I saw the deodorant at Whole Foods, I knew I'd love it. It's a gel stick and glides on clearly and smoothly and the light, fresh scent is amazing. Although this is a stick deodorant, it goes on clear and dry, which is one of the reasons I like it so much. The scent is subtle but perfumy. I keep this deodorant in my gym bag since it goes on clear and won't show up on the sleeves of my workout tanks as I sweat. This is one of the very first natural deodorants that I bought, and I still love it to this day. The scent is very light, and I often apply it a few hours before I go to bed since it contains lavender. It also contains aloe vera, so it's great if you have sensitive skin.